In the paintings of John Noel Smith, the eye follows the line, until the eye is distracted. The line both offers structure to the painting and is a sort of scaffolding that can be dismantled, as other things, such as texture and tone, depth and colour, take over. But the dismantling is itself often illusory as the system of lines he has made becomes oddly essential in the process of looking. The paintings are like buildings where signs of the construction remain as an integral part of the building’s very presence, as an essential part of the effect it has, how it pulls the energy in towards itself.. The dynamic spirit of these paintings arises from the conflict between an architectural solidity and a more tentative set of traces and clues and signs; the work is nourished by the conflict between the hardness of a decision about a plane of colour and the softness of something much more mysterious and unspoken within the inner reaches of the painting. John Noel Smith also plays with the idea of symmetry that offers comfort and certainty to the eye, and then makes a break in the symmetry. But even more important, he creates a sense of the symmetry as pure surface mark, almost like punctuation in prose, or as distraction, while the real work goes on in the way the paint is textured, and its tonal variety, and the sense of depth and inner space that he handles with grades of subtlety and guile. There are times when the eye moves between the lines, towards a space that has been confined or enclosed. This space seems, on first looking, to be mere surface space, mere background, while the snaking or straight lines offer the real foreground. But then, as the eye moves, this inner space can slowly become the real weather of the painting. The intense inner life of the work seems to come from there. In this way, the canvases seem oddly haunted by the smaller marks, by the sense of erasure, by the idea that much was withheld, then added, then withheld again until that very process became thematic, memorable. The images Smith makes are filled with what is tentative and must have been, at one time, uncertain, but have now been rendered into certainty. He knows when to leave a painting alone, and is also alert to the need at times for a decision that is unrisky, solid. He often needs to make a section of the painting that is utterly sure of itself. Sometimes, when he does this, his choice of colour is beautiful, inspired, rich with the sheer pleasure of putting the paint there. The textured ease he can create with such facility has a comforting grace. In his work, these heard melodies are sweet, but his unheard ones are sweeter. Smith is interested in exploration, at times excavation, as much as he is interested in giving the surface of a painting a sharp sense of what he already knows. He works then with what is peeling away and crumbling and unfinished and unstructured. He works with an inner pattern beneath the dominant pattern or outside its sway. It is like a sound that echoes, sounds again, becomes faint and then can be clearly, magisterially heard. In visual terms, this is not the cloud of unknowing being cleared away as much as it is a space that is marked and spotted and dotted with fresh knowledge. While Smith, in his paintings, does not cease from exploration, his aim is not only to allow the very process of exploring to become apparent, but to suggest that in finishing the work some end-point has been reached. In this way, the gestures he makes as a painter are not all emotional and painterly and open-ended, they are also considered, structured. The paintings are destinations as well as journeys. Smith is unusual as a painter in that, since he thinks with the swirl and immediacy and sensuousness of paint, he can actually afford to think. He can leave himself free to think if he needs to. The sense of the cerebral in his work is often tempered, however, by pure feeling, by instinct, but that in turn is tempered by mindfulness and restraint. In these paintings, the mind is at work as well as the eye and the hand. As Elizabeth Bishop has it in her poem ‘At the Fishhouses’, since Smith’s knowledge is historical, then what he does is flowing, and flown. The paintings deal with paint and pattern, but they are also deeply nourished by the world itself, by shapes in nature, by knots, by the shapes that appear when the structure of the world is closely, or microscopically, examined, by waves and particles. But the canvases are also nourished by the idea of connection and disruption, by the clash or the intersection between the straight line and the line that curls, by colour that is easily named and shades within shades that are much harder to be sure about, that hit the nervous system uneasily. Some of the marks also suggest human marks, such as the swirls and elaborate designs in early Irish illuminated manuscripts, such as early writing, such as patterns in stonework, such as signs that have been left in the landscape by culture as much as by nature. They also embody or dramatize human struggles or the conflict between tension and ease, between what is coiled and highly charged and what has been assented to. Their impact, then, requires considerable engagement. On looking at a painting by John Noel Smith we have to connect with his pure trust in the medium of paint, in what it can do. And we have to be ready to be unsettled and unsure as clarity is played against complexity, as surface is played against depth, as line is played against trace and texture, as the thinking painter has to confront and give power to the great mystery of things, as his bravery as a painter confronts a deep, inner humility. 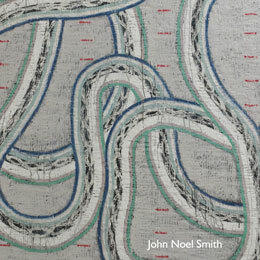 John Noel Smith – Moving Lines. Dublin: Hillsboro Fine Art, 2017.